The 2018 Arthur C. Clarke shortlist is going to be announced in two days and, as you may or may not know, I have been following this award for a few years now and it is my personal Oscar. I love to compare the submission list to what end up on the actual shortlist and compare it to what I think was the best science fiction books of the past year. Of course, most of the time I haven’t read half of the titles on the list and the prize is great way to learn about new books. For the past two years I have been reading and reviewing every book shortlisted and I really love doing that so, hopefully I will have the time to do so this year so brace yourself for a lot of Clarke Award content! Since I really cannot wait to see the shortlist, I have decided to make predictions and create my own personal shortlist out of the submissions. I am pretty sure this won’t look like the shortlist but it’s fun to do so… The books mentionned below are either books that I read and loved or books that I heard a lot about and that I think might be worthy Clarke contenders! If you want to make your own predictions list, you can check out the 2018 Submission List and please tell me what you ended up choosing! That the cruel, ambitious monster of Bram Stoker’s most famous novel was once Vlad III Dracula, Voivode of Wallachia – the Impaler, to his enemies – is known. A warleader in a warlike time: brilliant, charismatic, pious, ferociously devoted to his country. But what came of him? What drove him to become a creature of darkness – an Un-Dead – and what use did he make of this power, through the centuries before his downfall? Decades after the monster’s death, Jonathan and Mina Harker’s son Quincey pieces together the story: dusty old manuscripts, court reports from the Holy Roman Empire at its height, oral traditions among the Szgany Roma people who once served the monster. 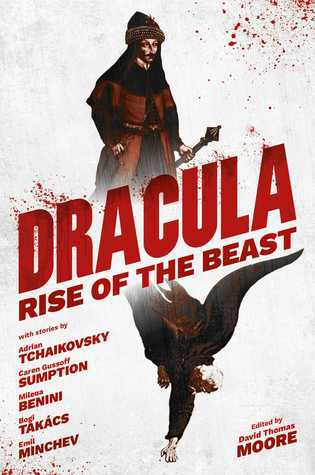 Dracula: Rise of the Beast is an anthology of five novellas interconnected by a series email between two protagonists who are studying Dracula. The stories are loosely connected and present the many facets of Vlad Dracula: from the Ottoman Wars to the modern days. As usual with anthologies, a few stories didn’t work for me but for the most part, I found this collection very interesting and quite refreshing. You could ask yourself what’s new about Dracula but I assure you that those stories will change your mind about that! A Jewish rabbi and his nephew spy on Vlad Dracula in a series of letters. I have to say that this story was the one that impressed me the least and since it’s the first story of the anthology, it didn’t leave me with a great first impression. It took me days to read because I had trouble getting into the story. It is extremely slow-paced and I felt like we didn’t learn a lot about Dracula in this one. I always look forward reading any of Tchaikovsky’s stories, his name was one of the reason I was interested by this particular anthology. This story follows Erzsebeth Báthory, an Hungarian countess famous for her murders (I had to Google that because while reading I felt like I was missing something and she existed! you can read more about it here). She was rumoured to bathe in the blood of the innocents she murdered in order to remain young, always. Because of that, she gained the surname of Lady Dracula and it is Tchaikovsky’s takes on this urban legend. This story was quite horrifying as we read diaries entries written by Báthory as she slowly experiment with her victims in order to win her battle against Dracula. Her character is brutal and unforgiving and it was fascinating to see how sure she was of the right of her actions. A tragic story of two brothers that can’t live together. What surprized me the most about this story was how much Dracula’s character felt relatable to me. In most stories, he’s the bad guy yet in this one story, he felt almost human. I cannot say he was likeable but as far as a vampire goes, he was quite nice! I wish Vlad and Radu’s history could have been more detailed, the ending felt a bit rushed and and the story too surface-level for my liking. I wish we had had a bit more knowledge about their relationship and their inner conflict. I still enjoyed this story but I wanted more. Children of the Night is definitely my favorite story of the anthology. It is one long letter written by Dracula to one of his vampire friends where he counts his love affair with a monster. It was extremely gruesome and horrifying yet strangely fascinating to read about. We learn how his children came to be and how Dracula was seduced by the strange creature. It sure is an odd story but I was hooked from the start! This novella counts three different stories focused on Romanian women connected through the ages. It is told thanks to a mix of documents such as diaries entries, blog posts and letters and we slowly learn how the women are connected. It was another great story centered around family and Romanian culture. I don’t want to say much more than that because the beauty is discover bit by bit how the storylines intertwine with each other! This anthology was a very interesting take on the Dracula myth. It was fascinating to discover different interpretation of the same character through the eyes of various authors. In my opinion the Dracula of this anthology was way more interesting than Stoker’s Dracula as he felt more alive (odd choice of word to describe a vampire isn’t it?) and complex. As usual with anthologies, all the stories didn’t all work for me but for the most part, I found them good and they push me to make some research of my own. I’m also happy to have discovered some new-to-me authors since the only author I heard about previously was Adrian Tchaikovsky. I definitely want to read some more stories by Caren Gussof Sumption and Emil Minchev! Required reading to any Dracula fan and highly recommended to horror and dark fantasy lovers! I received a copy of this book through Netgalley. My thanks to Rebellion Publishing, all opinions are my own. The Bear and the Nightingale is a fantasy book following Vasya, the daughter of a powerful family who has special gifts: she can see spirits. Even before her birth, her mother predicted that her daughter would have special links with the nature and indeed, even if she passed away a few moments after giving birth to her strange child, her predictions were true and her child with the ability to see more than she ought to. However, a few years after her mother’s passing, Vasya’s dad bring home a new wife from Moscow. What he doesn’t know is that his new wife also has the sight and, unlike Vasya, she doesn’t think having spirits in her house is such a great thing to have. More than that, she thinks that they are the child of the devil and thus, decides to call for a priest from the capital. Konstantin, a very charismatic young priest then joins the household and slowly convince everyone that they should stop giving tribute to the housespirits and stop believing in childish fairytales. However, because of the lack offerings, the spirits slowly start dying even with Vasya’s efforts and they are left without protection against the real monsters roaming the snowy forest that surrounds them. I fell in love with Arden’s prose in a few pages, the writing is lush and draws a beautiful and terrifying picture of the unforgiving Russian winter. If you want to read this book, prepare yourself for a story full of fairytales and folklore with rich characters that you can’t help but to understand (even when they are being awful!). This book is everything I wanted Uprooted to be and more. 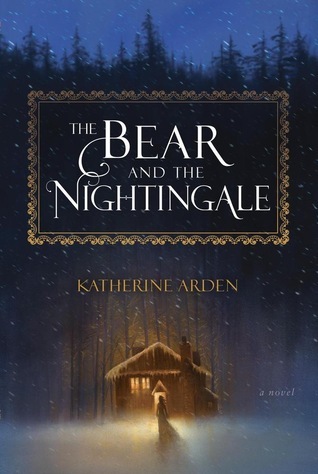 As much as I thought Uprooted was lacking both in term of plot and characters, The Bear and the Nightingale succeeded in pretty much everything. It is a debut but I wouldn’t have noticed if I didn’t know that going in. The story is very slow-paced but at no points I felt like Arden was dragging the story, she just took her time introducing and building her characters to the point where I felt like I knew every single one of them. It never felt tedious or boring, on the contrary, it allowed me to have a connection with them. The same goes for the antagonists, even when they acted horribly toward Vasya, I could always understand where they were coming from and why they acted that way. Vasya’s character is great, I think she might be one of my favorite protagonist period. Sure she’s quite stubborn but she is very independent and she’s trying her best to protect everyone around her, even people she doesn’t has any warm feelings toward. She’s feisty and mischevious but she has a big heart and she thinks before doing anything stupid. Her relationship with her siblings was wonderful and reading their banter was a great time! I would absolutely recommend this book, it is the first in a trilogy but the story can perfectly stand on its own. I will definitely pick the sequel up soon because I want more slow burn, atmospheric and eerie books!